Kakteen-Freunde 2: Nos. 8 & 9, 91,103, fig. 1933 ; cf. Backeb. Blatter Kakteenforsch.1934, Pt. 5, [P. 6]. Altitude: 3000-3350 meters above sea level. Habitat and Ecology: This cactus grows in dry shrublands on rocky soils, at high altitudes. Echinopsis densispina var. amblayensis (Rausch) J.G.Lamb. Echinopsis haematantha subs. chorrillosensis (Rausch) J.G.Lamb. Echinopsis haematantha subs. elongata (Backeb.) J.G.Lamb. Echinopsis haematantha subs. hualfinensis (Rausch) J.G.Lamb. Echinopsis haematantha subs. hualfinensis f. variegata hort. Echinopsis haematantha subs. jasimanensis (Rausch) J.G.Lamb. Echinopsis haematantha var. kuehnrichii (Frič) J.G.Lamb. Andenea kuehnrichii Frič & Kreuz. Lobivia drijveriana var. astranthema Backeb. Lobivia drijveriana var. aurantiaca Backeb. Lobivia drijveriana var. nobilis Backeb. Description: Lobivia drijveriana (= Echinopsis haematantha var. kuehnrichii ?) is a very interesting cactus with yellow, salmon to bright orange, green throated flowers up to 5 cm wide. 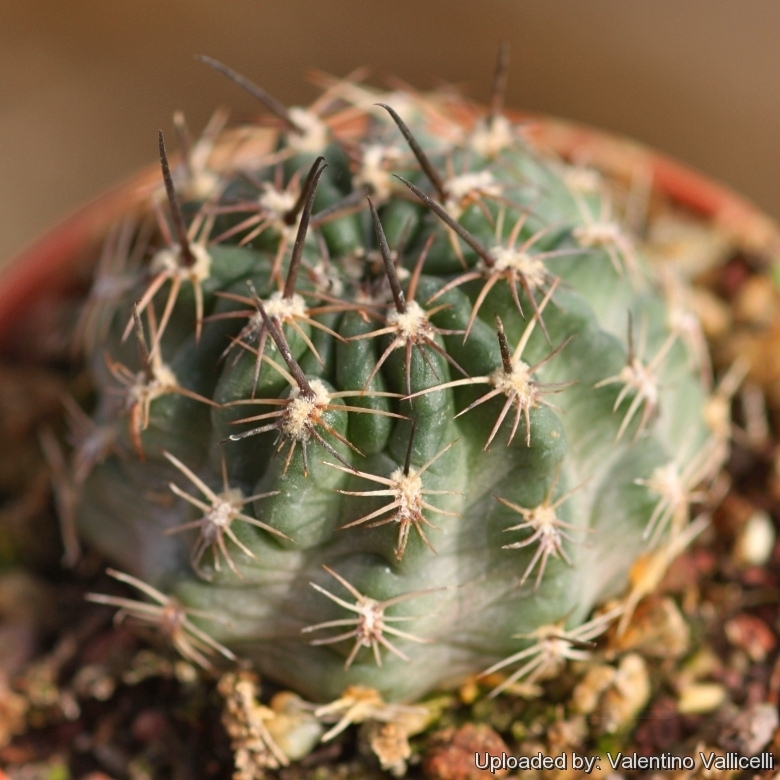 It is one of several varieties of Echinopsis haematantha that comes in several colours and spinations this polymorphism has led some authors to describe a lot of unnecessary varieties. The "drijveriana" is one of them. Habit: It is a geophyte cactus, usually solitary, or slowly branching to form small clumps. Stem: Somewhat depressed, globose to short cylindrical. Silky, somewhat shining, grey-green, to pinkish or brownish-green, 5-8 cm tall, 5-7 cm in diameter. Areoles: Nearly circular white, felted. Spines: Not heavy, pale pink/brown, orangish to dark brown. Flower: Diurnal, broadly funnel-form, pure yellow to orange with usually a greenish throat circle, 3-4 cm wide. Scales on flower tube with long wool. Fruits: Globose to ovoid, green to brownish-violet, semidry, dehiscent. Echinopsis amblayensis (Rausch) Friedrich: has rich orange-red flowers and green stigmas. Distribution: Amblayo, Salta, Argentina. Echinopsis amblayensis var. albispina (Rausch) Friedrich: has short, glassy, mostly cream white in variable number. Distribution: Amblayo, Salta, Argentina. Echinopsis haematantha subs. chorrillosensis (Rausch) J.G.Lamb. : has a deep taproot, greyish-green stems, short pale radial spines, longer curved central spine and flower colour from red through to yellow. Distribution: Chorrillos, Salta, Argentina. Echinopsis haematantha subs. hualfinensis (Rausch) J.G.Lamb. : has silky grey-green, olive-green to brownish-green stems, heavy, curving spines and orange to bright red flowers, with a white or yellowish throat circle. Distribution: Northern Argentina. Echinopsis haematantha subs. hualfinensis f. variegata hort. : has green and yellow variegated stems. Garden origin. Echinopsis haematantha var. kuehnrichii (Frič) J.G.Lamb. : has yellow, salmon, orange or carmine flowers up to 5 cm wide. The flowers throat is white or green. Distribution: Cachipampa to Potrero, Salta, Argentina. Lobivia drijveriana Backeb. : same as Echinopsis haematantha var. kuehnrichii? Distribution: Cachipampa to Cachi, Salta, Argentina. Cultivation and Propagation: Lobivia drijveriana is a summer grower species that offers no cultivation difficulties. Soil: Needs a large pot to accommodate a large root system. Use a very draining and porous substrate that allows therefore roots to breath, since it's natural habitat is in volcanic soil, it has adapted to more acidic conditions. Water: They like only a short winter's rest and should be kept almost completely dry during the winter months, If the soil is allowed to be dry for too long root loss could follow but equally the same result would occur if the plants are both wet and cold. From March onwards the plant will begin to grow and watering should be increased gradually until late May when the plant should be in full growth. Water regularly during the summer so long as the plant pot is allowed to drain and not sit in a tray of water. During hot weather you may need to water the plants more frequently so long as the plant is actively growing. From late September watering should be reduced to force the plant to go in to a state of semi dormancy, by October you should be back in to the winter watering regime. Exposure: It needs full sun avoiding only the harshest summer sun, if kept too dark it may become overly lush and greener and could be prone to rotting due to over watering. Fertilization:Feeding may not be necessary at all if the compost is fresh then, feed in summer only if the plant hasn't been repotted recently. Do not feed the plants from September onwards as this can cause lush growth which can be fatal during the darker cold months. Maintenance: They should be re-potted frequently until they attain their desired size. Pests & diseases: It is especially susceptible to spider mite mealybugs and scales infestation.